Home / Archive by Category "Career Corner"
Are you thinking about ways to improve your job skills – like getting a better understanding of how budgeting can improve management, or maybe you want to improve your design skills? Or did watching Tarzan this summer make you curious about what’s happening in contemporary Africa? Did seeing Ghostbusters inspire you to think about how popular culture shapes the way we think about gender? Now is the time to sign up for a Spring semester class using the Tuition Waiver Program. As the Office of Human Resources presented at a recent Employee Forum meeting, this program enables eligible employees—permanent employees working 30 hours or more a week—to waive tuition for up to three eligible classes per academic year. During the academic year, employees may use the tuition waiver at any UNC system school except the NC High School of Science and Math, but waivers for Summer Sessions are more restricted. Take stand-alone courses to build skills in particular areas: maybe a stats course would enrich your ability to conduct assessment for your unit or a language course help you serve your program’s clients more effectively. The School of Media and Journalism offers a “Multimedia Bootcamp” for a crash course in shooting and editing video. Use the tuition waiver to accrue credits and complete requirements before formally enrolling in a degree program: whether you are pursuing a bachelor’s, a master’s, or a PhD, some programs allow (or even encourage you) to take credits before you start paying tuition. Most of these requirements are set by individual programs, so you should contact the program directly to find out more. Pursue a certificate that enhances your professional profile. For example, one employee earned a Certificate in Technology and Communication to take on new job responsibilities. Unfortunately, there is not a comprehensive list of all the certificate programs the university offers, but individual program pages will have that information. The Tuition Waiver Program can also enable you to follow up on your personal interests in a formal academic setting. Whether you want to learn more about the way the human mind works or principles of local government, UNC offers courses on every subject you can imagine. If UNC Chapel Hill does not offer the course, one of the other system universities may offer the course, online or in the classroom. If you claim the tuition waiver, the value of the waiver could count as taxable compensation and all tuition waiver amounts are reported to Payroll for taxability purposes. Consider how that additional compensation may impact your taxes. The tuition waiver covers student fees, but it does not cover the cost of books, lab fees, or other course-specific fees. If the course is during your regular work hours, you will need to seek your supervisor’s approval before enrolling. Luckily, there are lots of ways to make taking a work-time class possible. The University’s policy allowing flexible work arrangements is one such option. Not all courses are eligible for the tuition waiver, especially receipt-supported courses. HR’s webpage on the Tuition Waiver Policy provides detailed guidelines to applying for the waiver. First, you must apply for admission to the program through which you want to take courses. Then, complete the paperwork to apply for the tuition waiver. After you have secured the waiver, you must then enroll in the course itself. Make sure you allow yourself enough time to meet all deadlines and for HR to process the relevant paperwork. Several offices are working together to create an online form and submission process; they hope it will launch during the Spring 2017 registration window. Below are several professional development opportunities to consider for Spring 2016.These are just a few of the programs on campus offering career opportunities for staff and faculty throughout the year. Please visit these sites to learn more about enrichment classes, professional development and career possibilities that await you! Offers engaging and innovative public seminars and lectures on a variety of topics and themes throughout the year. Programs draw upon the humanities to nurture a deeper understanding of history and culture, enrich the life of the mind, and contribute to the development of a more humane world. To view a listing of all upcoming programmatic events, visit their Program Calendar. Offers up to 200 courses, workshops, webinars, and professional conferences each year. Go to https://www.sog.unc.edu/courses/ for more information. Explore Public Health Careers! 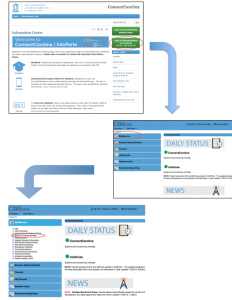 Departmental Career Resources with information about many career paths. For more information, go to http://nursing.unc.edu/about/. 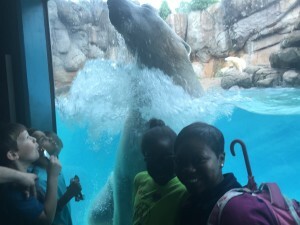 Forum delegate Ronda Manuel recently went with her daughter’s entire second grade class to the North Carolina Zoo–and got paid by UNC to do it! Manuel was able to spend this important (and fun!) time with her daughter by using the Community Service Leave (CSL) benefit. Community Service Leave “is a paid time off program to participate in the educational process of children through the high school level and to support other community service volunteer activities for non-profit organizations.” Because the “University recognizes the importance of community involvement and encourages employees to participate in volunteer activities,” CSL “provid[es] flexibility in work schedules and paid leave opportunities,” enabling employees to take time during normal work hours to contribute to educational institutions and give back to their communities. Ronda Manuel chaperones her daughter’s school field trip to the NC Zoo. Ronda Manuel and her daughter watch polar bears at the NC Zoo. 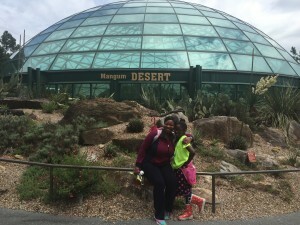 Ronda Manuel and her daughter pose at the Desert Exhibit at the NC Zoo. Working with her supervisor, Manuel scheduled her CSL to accommodate her job responsibilities. 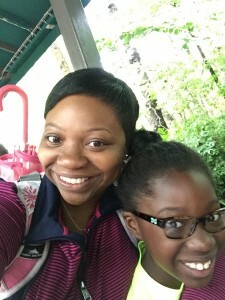 She said, “I am grateful for the opportunity to use to serve as a chaperone for my daughter’s field trip to the NC Zoo. Not only did I get the chance to give back to my daughter’s school, but I also made lasting memories with my child and her classmates.” In this instance, CSL allowed Manuel to balance her family commitments while also supporting UNC’s mission of public service. Brandy Flickinger, leave administration manager in the Office of Human Resources, presented information about CSL at the May 4 Employee Forum meeting. CSL comes in three options. Option A, which Manuel used, grants employees up to 24 hours of paid leave in one calendar year to take part in their child’s education (e.g., meet with a teacher or attend a school-sponsored event—not including athletics) or to volunteer with a recognized community service organization. Option B allows eligible employees up to 36 hours of paid leave per calendar year (1 hour/week while school is in session) to volunteer as a mentor or tutor with a formal, standardized program. Option C grants employees up to 45 hours of paid leave per calendar year to volunteer in a literacy program through a public school. There are additional types of community service leave such as Disaster Recovery and Emergency Services and Organ Donorship leave that may allow for more hours of paid leave under certain conditions. If you are interested in taking CSL, you should discuss the options with your supervisor. Q: Can I use CSL for volunteer service outside of NC? A: No, service must be provided within the state of North Carolina and must benefit the citizens of North Carolina. Employees can use approved vacation leave. The exception is for Disaster Recovery and Emergency Services [http://hr.unc.edu/policies-procedures-systems/epa-non-faculty-employee-policies/leave/community-service-leave/#Disaster_Recovery_and_Emergency_Services], but there are very specific conditions for eligibility. Q: Can I use CSL for on-site visits to colleges with my child? A: No. The “child involvement” provision of the policy is limited to child day care, elementary school, middle school or high school involvement. A parent cannot, for example, use community service leave for on-site visits to colleges for the purpose of selecting a college, or to attend college orientations or assist with moving the child in and out of the on-campus housing, or for attendance at college graduations. Q: Is service for a fundraising event eligible for CSL? A: It depends. Playing in a golf tournament, such as the UNC Staff Assembly Chancellor’s Cup Golf Tournament [http://uncchancellorscup.com/] which raises money for the Janet B. Royster Memorial Staff Scholarship Fund, would not be eligible for CSL. However, setting up tents, handling parking and registration, or serving at the food tent at the fundraising golf event would be considered a volunteer activity and would be eligible for CSL. Q: Can I use CSL to vote? A: No. Employees may not use work time for voting. Bbecause polls are open for 12 hours or more on Election Day, employees are to vote on their own time either before or after their regular work schedule. Management does have discretion to allow flexible work scheduling to accommodate voting employees or to allow the employee to use vacation leave, bonus leave or other accrued paid time off for the absence. Q: Must I use CSL to participate in UNC’s campus blood drive? A: No! As an exception to the CSL policy, participating in the semiannual University-wide blood drives as either a donor or volunteer counts as work time for both permanent and temporary employees. (Participation does require prior approval, though.) Donating or volunteering other times, whether during another on-campus blood drive or at a Red Cross Center, is eligible for CSL (again, with prior approval by your supervisor). Using CSL is a great way to balance your work responsibilities and your other interests and commitments. It gives you a way to contribute to your child’s education or to participate in other volunteer activities that are important to you. Do you volunteer at a (recognized 501(c)(3) non-profit) animal shelter or coach your child’s robotics team? Would you like to take part in a Habitat for Humanity build day? Participating in the bi-annual Carolina Blood Drives counts as regular work time, but giving blood or volunteering to help with other blood drives, on or off campus, are both are eligible for CSL hours! For questions about what can count for CSL, contact the Leave Administration team (leave@unc.edu/ 919.843.2300). Story contributed by Kelli Raker and Clare Counihan. Photograph courtesy of Ronda Manuel. With additional reporting by Gabrielle Jones and Nakenge Robertson. Members of this panel emphasized that there are multiple and diverse routes into careers in institutions of higher education. In fact, a couple of the panelists seemed surprised to find themselves working at UNC! Martina Ballen, Senior Associate Athletic Director and Chief Financial Officer, worked at a local bank before being recruited to work at UNC. Jenny Goforth, a Research and Design Services Librarian, moved from the publishing industry to cataloging at Davis Library, where she learned that being librarian encompasses a broad spectrum of specialties—including work with social media. Christi Hurt, Assistant Vice Chancellor and Chief of Staff, found her way into Student Affairs through interpersonal violence prevention work and serving as the director of the Carolina Women’s Center, while OJ McGhee, IT Manager for Gillings School of Public Health, came to UNC from a background in video and TV production at the local and national level. Gabrielle Jones (ECDC) moderated the panel. All the panelists described jobs that vary from day to day: Hurt and McGhee combine policy work with trouble shooting (student and IT challenges, respectively), Ballen balances executive and hands on responsibilities, and Goforth moves between developing educational programming about library services and keeping up with technology trends. They also emphasized that one of the main “perks” of their jobs is the opportunity to keep learning, whether formally through programs like ULEAD or the tuition credit benefit or informally by taking on new roles. Finally, the panelists all recommended taking time to periodically reflect on career paths and job satisfaction: they may have ended up in careers they didn’t initially anticipate, but they got there by paying attention to opportunities as they arose and to their own skills and happiness. This panel examined the experiences of UNC staff who have focused their career within UNC, finding opportunities for professional development and advancement within the university. Panelists came from all corners (originally and now) of the University, from an array of position types. Shanya Hill, who has been at UNC for nine years, started in Parking Control and now works in the School of Dentistry as the Materials Manager. For the last three of her nine years at UNC, Ursula Littlejohn has been the Assistant Director of the MAC Program at Kenan-Flagler Business School. Taron Mattocks, a Tech Support Analyst with University Career Services, moved across the UNC system, to join Chapel Hill from Eastern Carolina University. Bob Pleasants, an Assistant Director at the Learning Center, started at UNC in 2008 as an Interpersonal Violence Prevention Coordinator—a position he helped create. Now the Student Affairs IT Director, Chris Williams has moved steadily through the IT hierarchy since he started in the Department of Housing and Residential Education’s IT department. Shale Hale (ECDC) moderated the panel. Despite the diversity of careers and routes within UNC, the panelists shared several themes. Both Littlejohn and Hill emphasized that they applied for new jobs based on the position description rather than the title. This way, they recognized the skills and responsibilities that carried from their previous to their current positions, rather than being discouraged by “fancy” titles. Hill and Williams both underscored taking advantage of professional development opportunities through UNC, from HR trainings to leadership development opportunities like ULEAD. Littlejohn, Williams, and Pleasants all recommended building genuine relationships with colleagues across the university: not only do you learn more about how the university works and how decisions are made, you develop a network of people who can share opportunities with you and vouch for you. (Plus, it makes work a more enjoyable place!) Mattocks, with Hill, Littlejohn, and Williams, focused on being proactive and positive, whether applying for a “long shot” position, advocating for a more accurate job description (and therefore payband classification), or shifting mindsets. Will Frey, a Professional Development Specialist with HR, gave a brief presentation on the kinds of training and professional opportunities offered by HR, including courses offered through UNC, as well as tuition waiver and education benefits. The Mini-Conference included a networking lunch, sponsored by the Employee Forum, during which participants had the opportunity to reflect on panelists’ comments and to make connections with other participants from across the university. Drawing together themes from all the presentations, Nakenge Robertson (ECDC) encouraged attendees to use what they learned from presenters in order to reflect on their future career pursuits. As so many panelists reiterated, career paths can be unpredictable, but thinking about what is right for you—what fits your professional needs and ambitions, what fulfills your values—positions you to take action to achieve your goals. Robertson closed the mini-conference by thanking participants for taking time from their schedules to invest in themselves. If you are interested in joining the Employee Forum or helping to organize this conference next year, please contact Matt Banks (matt_banks@unc.edu). Implicit social cognition can influence many areas of our work including, but not limited to: interactions with our colleagues, collaboration, supervision, advising, assessment, training, recruitment, hiring, policy development, and research. Learning about implicit social cognition is a vital first step if you want to pursue fair, equitable, and inclusive practices. In other words, recognizing how implicit bias shapes you is one way to make UNC a better place for everyone. Learn about how implicit bias works. The resources at the end of this article, along with materials you can find through the library database, are a great place to start. Peer-reviewed articles will provide research that’s been thoroughly vetted by scholars, but a number of magazines, such as Psychology Today and Scientific American, cover science for a popular audience. Librarians at the university and public libraries can help you if you’re not sure how reliable a source is. Acknowledge your own subjectivity; your personal position from and through which you see the world. Try as we might to be “objective” or “neutral,” none of us are really able to shed our experiences and social conditioning. Actively challenge your assumptions and stereotypes as you notice them. For example, if you catch yourself assuming that a woman wearing a “short” skirt is sexually promiscuous, pause to examine why that idea springs to your mind so readily. What stereotypes does it rely on? Is the stereotype consistent with your own beliefs? If someone applied a stereotype to you, would you think it was accurate? Alternately, you could counteract a negative stereotype with a positive connection: think about someone you know and respect; do their clothing choices impact your opinion of them? Find out your own implicit biases. Project Implicit, part of a Harvard-led study, has online exercises that let you see exactly how implicit bias works and how it affects you. 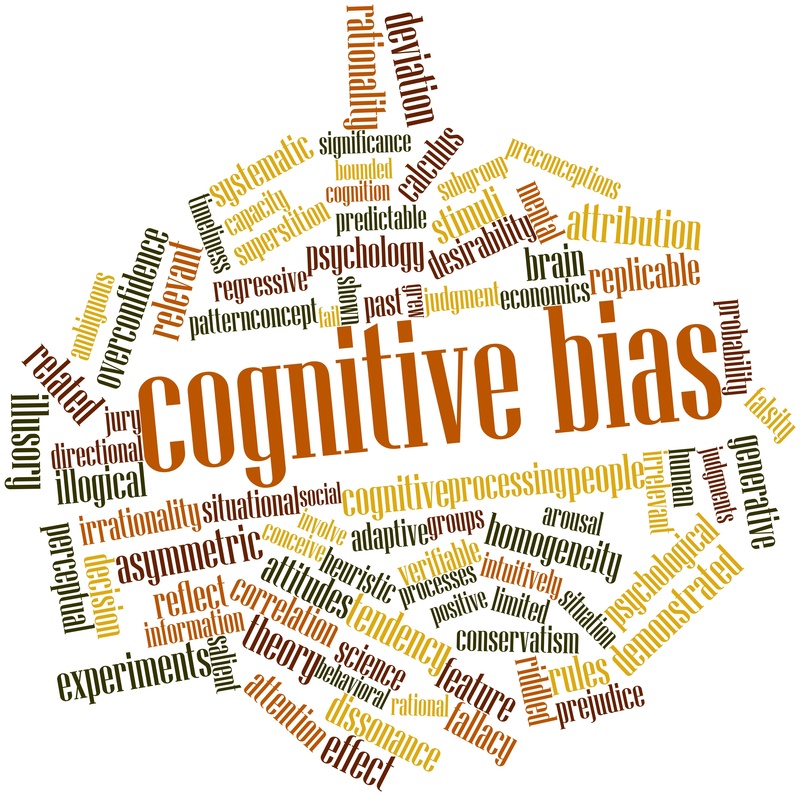 Its established measures (inventories) demonstrate some of the most common forms of implicit bias, and they give you a way to see how “objectivity” is really tricky. Challenge yourself to meet and talk to people who are different from you. Just as importantly, don’t be upset if people are hesitant the first time you approach them. UNC-CH, North Carolina, and the US have many layers of complicated histories around race, gender, sexuality, class, nationality, and physical ability (to name just a few). It may take time to develop trusting relationships given our current realities and complicated histories. Seek perspectives and input from a variety of individuals with multiple identities to reduce the effects of each individual’s biases. Adjust or restructure decision-making processes to reduce the potential for bias to have unwanted influence in the first place. For example, in one famous study, researchers hid musicians applying for places in an orchestra behind a screen. They found that concealing the gender of the candidate made it 50% more likely that women musicians would go further in the audition process. The widespread adoption of this audition method is responsible for dramatic increases in the number of women playing in professional orchestras. What processes in your department could be revamped to reduce the influence of bias? This list is a starting place for understanding your own implicit associations and their influence on your actions and your workplace practices. Please consider referring to the additional resources below as you continue to move through this process. Banaji, M.R., & Greenwald, A.G. (2013). Blindspot: Hidden biases of good people. New York, NY: Delacorte Press. Nosek, B.A., & Riskind, R.G. (2012). Policy implications of implicit social cognition. Social Issues and Policy Review, 6 (1), 113-147. Moss-Racusin, C.A., Dovidio, J.F., Brescoll, V.L., Graham, M.J., & Handelsman, J. (2012). Science faculty’s subtle gender biases favor male students. Proceedings of the National Academy of Sciences of the United States of America, 109 (41), 16474-16479. Retrieved from http://www.pnas.org/content/109/41/16474.full. The start of a new calendar year is a great time to hit the “reset” button on your personal and professional development and to think ahead with hope and excitement about which new doors may open in the months ahead. The Education and Career Development Committee of the UNC-Chapel Hill Employee Forum encourages you to capitalize on this fresh, ambitious mindset to set career goals for 2016! As individuals, we often focus on large, impactful career dreams like getting a promotion, changing jobs, or overhauling our work-life balance orientation. While those types of goals are absolutely worthwhile, they can often feel overwhelming, and minor setbacks can throw us totally off course. We see this same pattern with the big weight-loss resolutions people make: if they don’t see results right away, or they have one day of bad choices, they tend to give up on the goal completely. So, for life and career goals, we suggest breaking each big goal into the smaller steps that it will take to get to the big win. For example, what needs to happen for you to get a promotion or raise in your current role? Smaller goals that would add up along the road may include taking stock of the accomplishments you’ve been proud of so far and adding them to your resume, doing research to see what different salary or title might be fair based on comparable others, diving in to improve a particular process or add a new resource that you know would positively impact your office (and maybe your supervisor, specifically), and having a direct, thoughtful conversation with your manager about professional development. Breaking up a big goal for the year into smaller ones gives you a chance to celebrate multiple wins along the way and to really see your progress as it happens. Set goals you actually want to achieve. YOU. Not your family, not your supervisor, not society at large. Think about what changes or improvements would truly motivate you in your work life, based on your individual values. While you may have a colleague who prizes advancement or recognition, you may get the most out of interpersonal connections or contributing to large-scale, mission-driven projects. Dig deep and be honest with yourself, and use what would really make you happier and more productive in your professional life to guide your goal-setting. According to Dr. Phil, the difference between a dream and a goal is accountability and a timeline. We’ll address both in this article! Accountability is critical because the more people you tell about your plans, the more people you will have checking in on your progress (making you feel great when you can share your small and big wins, launching you back into action if you’ve been slacking, or offering support when you hit a snag and feel like giving up). These people can be your cheerleaders and coaches, so you don’t have to go it alone. Bringing others into the fold will make you feel more obligated to reach your goal, which can help you push through to the finish line. Think about a few different people in your life – friends, family, colleagues, supervisors, mentors – that you want to share your goal(s) with, and ask them to hold you accountable. It is incredibly important to set up “check points” for yourself in the months ahead to pause for reflection on your process and progress so far. Instead of thinking that the approach you try out in January is going to be the one and only way to get to your goal, and being disappointed if it doesn’t work, think ahead to when and how you can periodically check in with yourself on your career goals. Evaluate and reevaluate what is serving you, energizing you, and moving you forward towards your aspirations … and what is holding you back or taking you on an unproductive tangent. This type of regular, objective assessment will allow you to fix minor issues before they become bigger set-backs, and see the impact of changing or adding one or two small things to your process along the way. The people you identified to help you with accountability can also help you with reflection and reevaluation! Once you have set reasonably-sized, meaningful goals and have told people about your plans, it is vital that you set a timeline for your next steps. What can you do in the next 24 hours? This week? This month? Get out your calendar and plot out an agenda. And then be prepared to adjust those items as life creeps in or opportunities arise! Attaching dates to your process of moving towards a goal will help you stay on track, truly invest in what needs to be done along the way, and help make sure you are not front-loading or waiting too long on certain parts of your to-do list. We hope these tips help you make the most of 2016 and make your professional development a priority. The Education and Career Development Committee is always seeking new members (you don’t have to be an Employee Forum delegate!) and we will be starting up a professional development brown-bag discussion series this semester, as well. Please feel free to reach out to Committee Chairperson, Samara Reynolds (samara_reynolds@unc.edu) if you have any questions or would like to get involved. What are the Top 5 things your HR teams wish more UNC employees knew? We asked Kathy Bryant, Senior Director of HR Communication and Talent Development, to share. We’re passing the answers on to you, with some extra links with more information. Know which coverage level of the State Health Plan you’re enrolled in, as well as your retirement plan and other benefits. You can find this information through ConnectCarolina—which should look familiar from Open Enrollment. If you don’t know your premium rates and co-pays, you can look those up by finding your plan through ConnectCarolina, or you can go directly to your provider’s website, such as the State Health Plan for Teachers and State Employees. How does my retirement work? When can I retire? Can I borrow from my retirement plan? There is a wealth of information online about both Teachers and State Employers Retirement Program (TSERS) and the Optional Retirement Plan (ORP), or you can reach out to our Benefits Consultants for assistance. The NC Department of State Treasurer also has a lot of information, including a great Frequently Asked Questions section. For employees with ORPs, both Fidelity Investments and TIAA-Cref provide free services from financial advisors to guide you in making your selections and long-term strategy. Take advantage of resources through both TSERS and the ORP (depending on your enrollment) to find out how much you should be saving. UNC also offers several supplemental retirement plans that can help. How can I access professional development opportunities? OHR offers free courses that are available to all permanent employees. To see the list of current courses, visit http://hr.unc.edu/training-talent-development/upcoming-courses/. There are also many programs available to employees who wish to take college courses. For more information on these programs, including the Tuition Waiver program, see http://hr.unc.edu/benefits/work-life-programs/educational-programs/. And don’t forget to check out earlier Career Corner articles! How can I get current information on my benefits, see my paystub, enroll in training courses, and change dependent elections? All of these can be done through ConnectCarolina’s self- service functions. Log in and click Self Service. 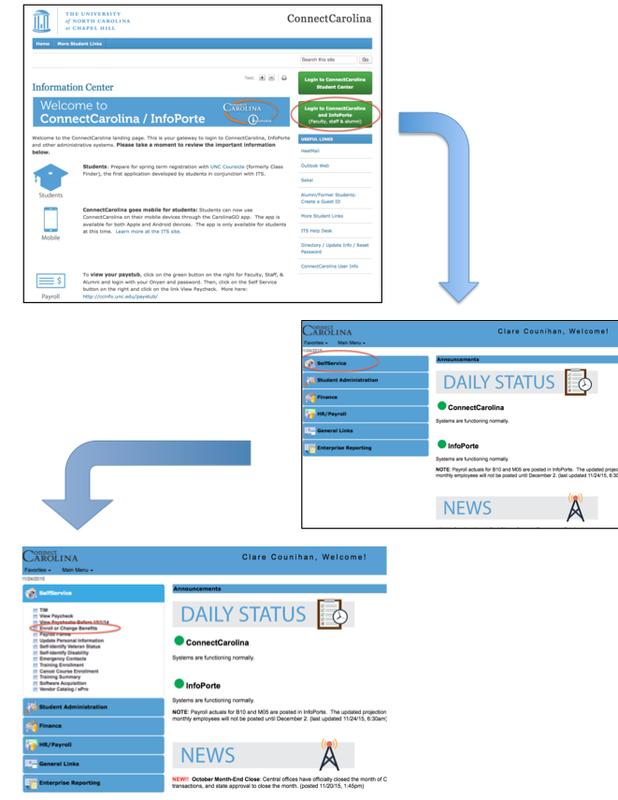 There are also a number of great tutorials in the Resource Center for ConnectCarolina– including a web tutorial about accessing your paystub (link opens in registration page for tutorial). If you have any other questions for HR, leave them in the comments! Professor Stephen Leonard, chair of the Faculty Assembly, and Rick Wernoski, executive vice dean and chief operating officer at the Eshelman School of Pharmacy, moderated the first and second panels respectively. They provided a set of discussion prompts to the panelists and moderated questions from the audience. Panelists discussed the changing expectations for higher education, the financial challenges of accessibility while ensuring educational quality and the value of higher education. The first panel focused on the challenge of communicating the more intangible values of higher education to nonacademic audiences, the impact of rapidly changing technologies on teaching and learning, and the needs for universities to anticipate future changes in the nature of higher education. The second panel addressed the business of balancing budgets and priorities in a system with finite resources, the potential and drawbacks of shared service models and the effect of changing student demographics on the need for on-campus support programs and services. Whether from the academic or financial side, all panelists shared a commitment to preserving accessibility. That accessibility enables North Carolina’s citizens to have a choice about their futures. As UNC-CH’s Vice Chancellor for Student Affairs Winston Crisp said, a college education allows people to go beyond work that feeds their bodies—that meets their basic human needs—to choose work that feeds their souls. Members of the ULEAD cohort posed a wide-ranging set of challenging questions, from the relationship between teaching and research for faculty to the need for diversity of students and employees to strategies to improve transparency and accountability within the university and across management levels. The panelists’ responses were open and thoughtful, recognizing that the ULEAD participants are the next generation of university leadership. Professor Eliana Perrin, associate vice chancellor for research at UNC-CH, stressed the need for employees to take control and communicate “up” to supervisors and let them know what is needed and why. In the same vein, Tau Kadhi, NCCU’s associate provost, emphasized tailoring communications to audiences, providing more detail “down the chain” and more succinct summaries to superiors. The annual conference, which changes every year to reflect campus needs and participant feedback, is a midpoint milestone in ULEAD, a leadership development program coordinated between UNC-Chapel Hill, NCCU and GA since 2010. Open to staff and faculty by application, ULEAD participants “gain the practical insight, knowledge, skills, and confidence needed for leadership effectiveness, through classroom sessions, active assessments of leadership characteristics, and participation in an intensive, practical project that addresses a major campus issue.” Each cohort is limited to twenty participants. The program lasts a semester and requires a significant time commitment, as well as nomination and a letter of recommendation from the applicant’s direct supervisor. To learn more about ULEAD, see UNC-Chapel Hill’s HR website for the program. Applications for next year’s cohort are due in March 2016. Members of the Employee Forum are invited to attend the ULEAD cohort’s final presentations on Nov. 12, 2015, from 8:30 a.m. to 2:05 p.m., at the Friday Center. Please contact the program director, William Frey (will_frey@unc.edu), for more information. The program is available here. Written and submitted by Clare Counihan, Employee Forum delegate. When was the last time you updated your résumé or your LinkedIn profile? Do you regularly review the projects you’re working on to see what skills you have developed—or skills you might want to develop to do your job better? It can be easy, in the bustle of your everyday work commitments, to forget that you are always preparing for your next professional opportunity, whether that’s an opportunity to take on a new responsibility in your current role, or taking on an entirely new position. What can you do to be ready for those opportunities? Keep your résumé updated: As you develop new skills in your current position and as your job changes, reassess your résumé every 6 months and revise it as necessary. After you’ve been in your job a while, you may realize that your job profile has completely changed. This is also a great way to prepare for your annual review: you’ll be ready to complete your self-evaluation with plenty of concrete details! Regularly check out available HR trainings: by reviewing your résumé, you may realize that you need to develop a specific skill to meet your changing job responsibilities or that you want learn a new technology to improve your current performance. When you identify a training that would be useful, be ready to explain to your supervisor why it makes sense for you to undertake it. HR Training sign up has moved to ConnectCarolina, so be sure you check for new trainings regularly. Don’t miss out on new opportunities. Several great (free) online resources are available to assist you with building, updating or targeting your résumé. Begin by logging into the Lynda.com learning platform through UNC’s single sign-on, and a wealth of tutorials awaits! Start here: http://software.sites.unc.edu/lynda/ and then search “resume.” “Designing a résumé” and “Personalizing the résumé” are great resources. We want to hear from you! If you have a topic you’d like the Career Corner to cover or if you have an article that you think your colleagues across UNC should read, share it with us in the comments section below.